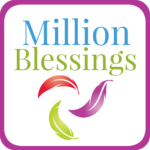 The Million Blessings Project is inspired by the notion that blessings count. And so do you. We’re printing one million tiny blessing cards, with unique inspirational messages. Think spiritual fortune cookie, and you’ll understand why we’re so excited. The ask is to simply share these blessings with friends, family, and (yes) total strangers. Watch this short video and see how it’s done. We’re a spiritually loving group of folks with outrageous passion for prayer. The Million Blessing Project is brought to you by Prayables, adding pray to your day since 2009. We’re a non-profit, non-denominational community of over one million women and men who receive blessings, prayers, and inspiration everyday in their email, online, and in their favorite apps. We’re printing batches of blessing cards in super-large quantities to take advantage of bulk printing prices. Let’s be clear. This is not a money-maker. This is a happy-maker. We’re working at cost (totally transparent) and are looking for generous partners who will support the Million Blessing Project through donations of time, money, and resources. We’re hoping you’ll consider taking part in this Godly mission. ONE. Order a Million Blessings bundle for yourself and receive the 2.5″ x 2.5″ printed cards in the mail. Only $12 for a bundle of 36 cards. TWO. Got a group? We’d love to customize the blessing cards with the name and messages for your non-profit, brand, or business. Let’s talk. THREE. Be a Million Blessings sponsor by providing funds for postage, printing, and distribution to others who can’t afford to cover the costs but have the will, the time and the heart to give away blessings. No payment required until your blessing bundle is ready to ship. Always 100% satisfaction or full refund. Thanks! You're on the pre-order list and we'll let you know when we're ready to ship. P.S. Did you know that “36” is a double blessing number? Judaism enjoys a rich history of numerology and the number 18 is particularly significant. 18 and its equivalent word “Chai” means life. The act of giving gifts in multiples of 18 is a beautiful tradition and is considered a life-giving blessing. That’s why we’re doubling the blessings and giving you 36 blessing cards to a bundle. Pre-order now!